Cooler weather has finally arrived on the Gulf Coast and our team here at Alligator Alley has been busy making sure our scaly friends are happy, healthy and comfortable over the next few months. Here’s a behind-the-scenes look at how alligators handle winter. Alligators are ectothermic (or cold-blooded) and play an active role in maintaining their own body temperature. If their internal body temperature drops below 55 degrees, they physically cannot breakdown or metabolize food. There is no digestion in the winter in order to conserve energy. 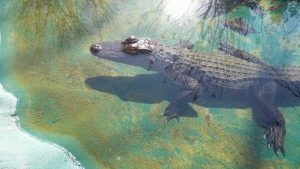 Smaller alligators may be able to eat further into the winter because they have a smaller body mass and can heat up and cool down faster than the large alligators. To conserve oxygen, an alligator’s heart rate slows to two beats per minute during the winter. The heart only pumps blood to the vital organs in order to stay alive. Alligators thrive in warm weather and are most active when their environment is between 82 and 92 degrees Fahrenheit. 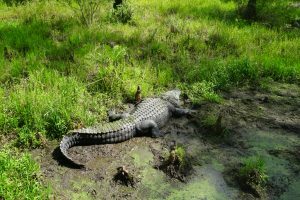 Alligators can remain active in environments as cool as 71 degrees Fahrenheit, however if the temperature drops any lower, alligators will dig underground burrows and remain there until warmer temperatures return, a process called brumation. Alligators may also submerge themselves with only their nostrils remaining above the water in a process called “icing response.” As the surface of the water freezes the alligator’s body may become trapped within the ice. With their nostrils above the ice, alligators can remain submerged for up to eight hours. In serious cases, the alligator may become frozen within the water’s surface but will swim free once the ice begins to melt. Fortunately for our alligators on the farm, the temps rarely drop low enough for this to be the case for them. The colder temperatures typical in the north are what limit the distribution of alligators to the southeastern United States. 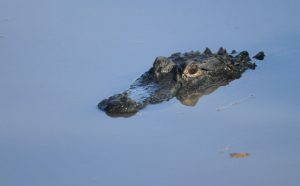 Thankfully, the temperatures in southern Alabama rarely fall below freezing, so you can still spot alligators on the farm in the fall and winter months. We try to give them a little break during their off-season, so make sure to check our website and Facebook page for our winter hours.